A true classic, our handcrafted solid wood Eden Dresser provides Early American charm and plenty of storage to enhance any bedroom suite you choose. The 48" design offers seven beveled edge drawers with dovetailed boxes that open wide to help you organize all of your bedroom items. Above, a spacious top provides more space for must-have items to keep them close at hand, providing ease to your daily routine. 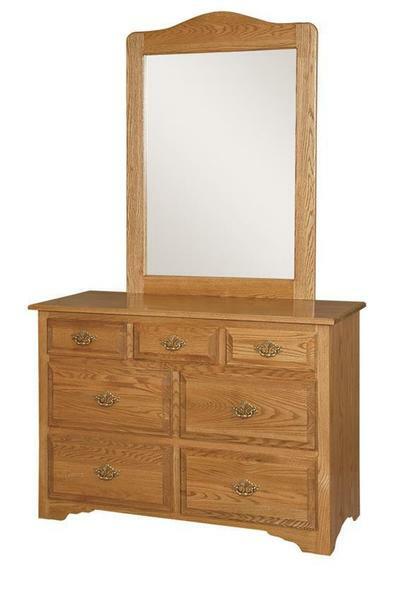 As shown, the optional matching mirror adds depth and utility to the dresser. Crafted with a same-wood frame that's stained to match, this addition offers a simple way to grab a passing glance anytime you're in your bedroom. Choose from a variety of wood and finish combinations to get the perfect fit to your suite. Shown in a classic Oak, you can also opt for Brown Maple, Cherry, or Quartersawn White Oak and get the dresser of your dreams. Finish it off with your choice of hardware and let DutchCrafters help you furnish a bedroom suite that you can fall in love with every day, for a lifetime to come.